BRAZEN boy racers put their ‘fingers up’ to Gardaí by targeting Newtown Garda Station in one of their now common displays of ‘diffing’, according to a local councillor. The ‘diffing’ or ‘donuting’ incident outside the Garda Station was one in all line of dangerous incidents that took place on main roads throughout the weekend. 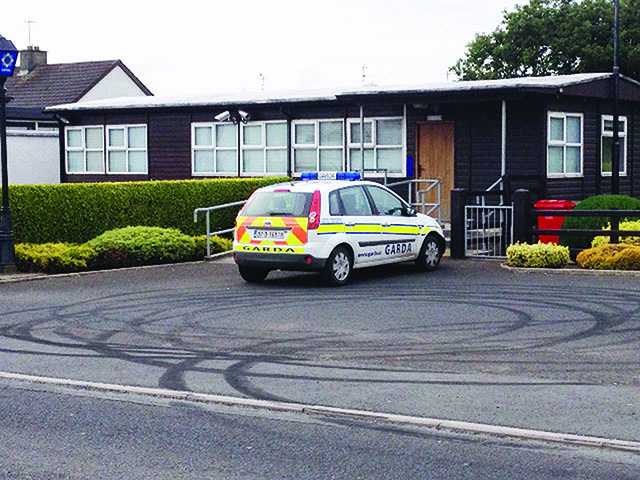 Our picture clearly shows the ‘donut’ marks on the public road outside the Garda Station in Newtowncunningham village. Newtown councillor Paul Canning said this is them putting their fingers up to the Gardaí. He also described it as a ‘kick in the teeth’. Throughout the weekend a large number of boy racers flocked to the county for the Donegal International Rally and it would seem they made their presence felt throughout the peninsula with the road markings particularly bad from Burt to Manorcunningham.